• Orzo • pasta shape like grains of rice. It is Italian for "barley". When cooked, orzo will look like a fluffy rice pilaf, & is excellent as a side dish. • Pappardelle • thinner & wider than fettuccine, derived from the Italian verb "to gobble up". • Penne • shorter and cylinder shaped, in Italian it means "quill". 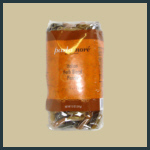 All our pasta packages are 12 ounces and will serve about three to four. 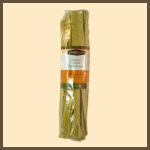 Here is your chance to create your very own pasta three piece mix & match pasta selection - and save a few dollars! We are guessing you know and love our pasta, so choose this either for yourself, or as an amazing gift for some lucky person! We combine the herbal garden-freshness of chopped chives with a punch of zesty garlic. We add just enough freshly cracked black pepper to give it pizazz. 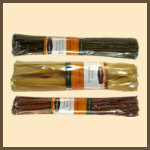 These flavors are incorporated into our almost-famous, lovely thin & silky 'pappardelle' noodles. At Nan’s penne is our favorite pasta shape – it is well suited to everything from pasta entrées, pasta salads to baked ziti. Add our favorite to our favorite country, Italy, and you get a mouthful of amazing herbs – oregano, thyme & basil to name a few. 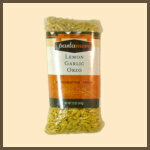 Orzo is small, rice shaped pasta, and our Lemon Garlic Orzo is delicately infused with real lemon juice, lemon peel, black pepper and garlic. It cooks up fluffy like a rice pilaf, and is great as a side dish, in pasta salads or as a 'bed' for an entree. 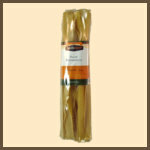 Other than our highest quality 100% durum semolina, what makes this pasta special is the shape. The broad noodle is celebrated in Italy with festivals honoring it. The name derives from the Italian verb “pappare", to gobble up. We do, and so will you!